The Bucs have lost 5 of 6 following a 2-0 start. Neither changing quarterbacks nor firing DC Mike Smith has been an answer to ending their current tailspin. TAMPA, Fla. (AP) — It doesn’t matter if Jameis Winston or Ryan Fitzpatrick is at quarterback for the Buccaneers. A porous defense keeps undermining Tampa Bay’s chances of winning. The Bucs (3-5) have lost five of six following a 2-0 start. 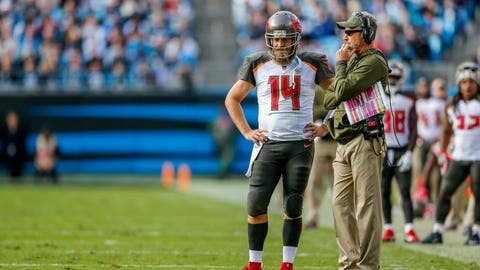 Neither changing quarterbacks nor firing defensive coordinator Mike Smith has been an answer to ending a tailspin that’s dropped the team into a familiar hole: last place in the NFC South, where they’ve finished six of the last seven seasons. The Bucs are first in the NFL in passing offense and second in total yards. But well as they’ve moved the ball through eight games, they’re just as bad defensively in allowing a league-high 275 points (34.4 per game) and ranking 30th among 32 teams against the pass. To make matters worse, Tampa Bay hasn’t forced a turnover in a club-record five consecutive games. Winston lost his starting job after throwing four interceptions two weeks ago. Fitzpatrick flourished early in the season filling in while Winston was serving a three-game suspension. However, in his last three starts the Bucs have been outscored 103-27 in the opening half. Inconsistency on offense has been part of the problem. Shoddy defense has been a recurring theme, even in the games the Bucs have won. Carolina scored on five straight possessions during one stretch of the first half to build a 28-point lead. Fitzpatrick rallied the team within 35-28 in the fourth quarter before the Panthers put away the game. The loss dropped the Bucs to 2-3 in games started by Fitzpatrick. Winston, who’s thrown 10 interceptions in four games, is 1-2. A common denominator in Tampa Bay’s three victories is the Bucs have played mostly with the lead and found a way to hold off New Orleans, Philadelphia and Cleveland late. In the other five games — all losses — opponents have compiled double-digit leads in the first half, and the offense has spent the second half trying to make up ground. Defensive end Jason Pierre-Paul said players have to own the ineffectiveness. Koetter said poor tackling was the primary culprit against the Panthers. Mistakes on offense and special teams contributed to falling by 28 in the second quarter. Fitzpatrick rallied the team from a big second-half deficit for the second straight week, only to fall short in the end, throwing for 243 yards, four touchdowns and two interceptions. Not good enough to win, but encouraging enough the Koetter said the 35-year-old will start again Sunday at home against Washington. “We know we have the talent, it’s just we can’t keep digging ourselves in these holes, especially on the road,” Fitzpatrick said.